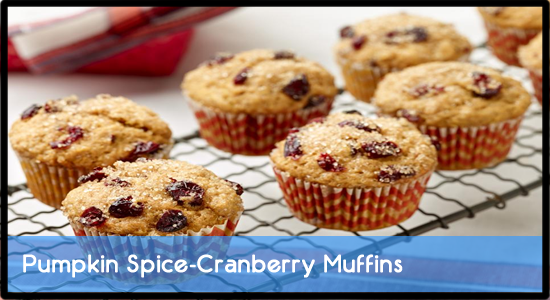 Preheat the oven to 350 degrees F. Line a 12-cup muffin pan with muffin liners and lightly coat with cooking spray. Combine the cranberries and orange juice in a small microwave safe bowl, cover the bowl with plastic wrap and poke a small hole to vent. Microwave until the orange juice is warm, about 1 minute. Set aside to let the cranberries plump, about 5 minutes, then drain off the juice. Whisk the flour, granulated sugar, pumpkin pie spice, baking powder and 1/2 teaspoon salt into a medium bowl and set aside. Whisk together the butter, plumped cranberries, pumpkin puree, milk, eggs and orange zest in a large bowl. Add the flour-spice mixture to the pumpkin mixture and gently fold the batter together until it is just combined (it’s ok if there are a few lumps). Divide the batter evenly among the prepared muffin cups and sprinkle the top of each muffin generously with the turbinado sugar. Bake until golden brown and a toothpick inserted in the center comes out clean, 20 to 24 minutes. Cool the muffins in the pan for a few minutes before transferring to a wire rack to cool completely.